December is flying! It's hard to believe it's already time to wish those of you who celebrate, a very Merry Christmas. I hope all of your last minute preparations will fall magically into place. This beauty was created by Beth Reece of Virginia who has only been quilling since last spring. Proof that as long as one has an eye for design and the desire to work small and with care, it's possible to do great things with strips of paper. See more of her amazing Christmas quilling and a free quilled snowflake pattern. I'll be back next week with new things to share, but for now I'd like to wish each and every one of you a very special weekend ahead! Lovely lovely quilling Ann, very elegant. Merry Christmas to you. merry christmas and happy holiday to all! A special weekend for you too, dear Ann. Indeed the wreath is spectacular, and I also love the links you`re showing to us. merry Christmas, Peace and Joy. Wishing you all the joys and delights of the holiday season. Thank you for providing so much wonder and beauty throughout the year. Happy Holidays to you, Ann ! I love Beth's quilled wreath, just beautiful! I wish you and your family a very merry christmas and I look forward to reading about more interesting paper related articles on your blog. oh gorgeous! i love the crimped details. thanks for sharing all you do and find, ann! wishing you and yours a very happy holidays and the best for 2012. I hope you have wonderful Christmas, Ann! What an honor to have my work showcased on Ann's site. There is some STUNNING work here! Beth from Virginia Merry Christmas everyone. 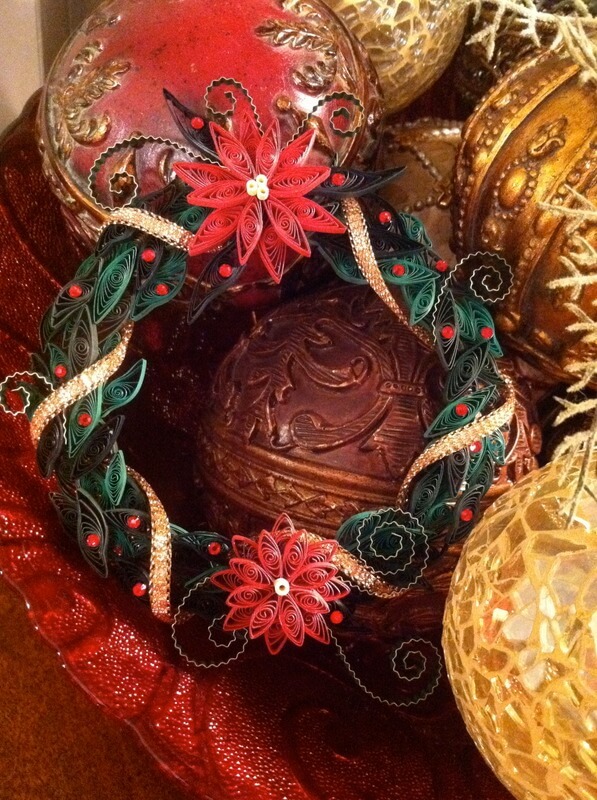 This is a beautiful wreath and gorgeous quilling! I would love to have the directions for this to try a bit later (I have a cast on my arm right now). I made a couple of your free designs and they turned out good, with a little practice I hope to do better. Merry Christmas to you and thank you for all the things you share all year long! Beautiful and delicate! Merry Christmas Ann and a Happy New Year! Greeting from Romania! Thanks for all of the good wishes, everyone. If you enjoy the posts even half as much as I enjoy writing them, that makes me happy!